Our paper got accepted with a 32% acceptance rate this year! Syed, M., Anggara, T., Duan, X., Lanski, A., Chawla, N. & Ambrose, G. A. 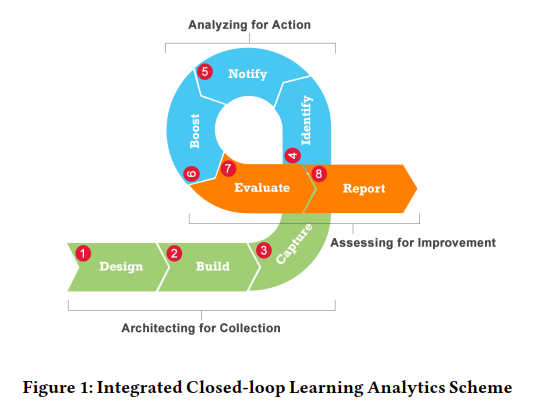 (2018) Learning Analytics Modular Kit: A Closed Loop Success Story in Boosting Students Proceedings of the International Conference on Learning Analytics & Knowledge. Abstract: As more and more college classrooms utilize online platforms to facilitate teaching and learning activities, analyzing student online behaviors becomes increasingly important for instructors to effectively monitor and manage student progress and performance. 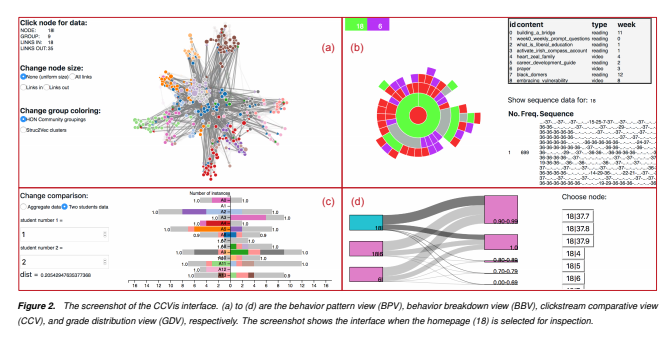 In this paper, we present CCVis, a visual analytics tool for analyzing the course clickstream data and exploring student online learning behaviors. Targeting a large college introductory course with over two thousand student enrollments, our goal is to investigate student behavior patterns and discover the possible relationships between student clickstream behaviors and their course performance. We employ higher-order network and structural identity classification to enable visual analytics of behavior patterns from the massive clickstream data. CCVis includes four coordinated views (the behavior pattern, behavior breakdown, clickstream comparative, and grade distribution views) for user interaction and exploration. We demonstrate the effectiveness of CCVis through case studies along with an ad-hoc expert evaluation. Finally, we discuss the limitation and extension of this work. -Encourage greater faculty involvement in the Apereo community. The Apereo Foundation (http://www.apereo.org/) is a non-profit organization, with members drawn from higher education on four continents. It’s core mission is to provide a framework to assist and facilitate educational organizations to work together to foster, develop, and sustain open source technologies and innovation to support learning, teaching, and research. Apereo also provides a common organizational umbrella for higher education open source software projects and communities. 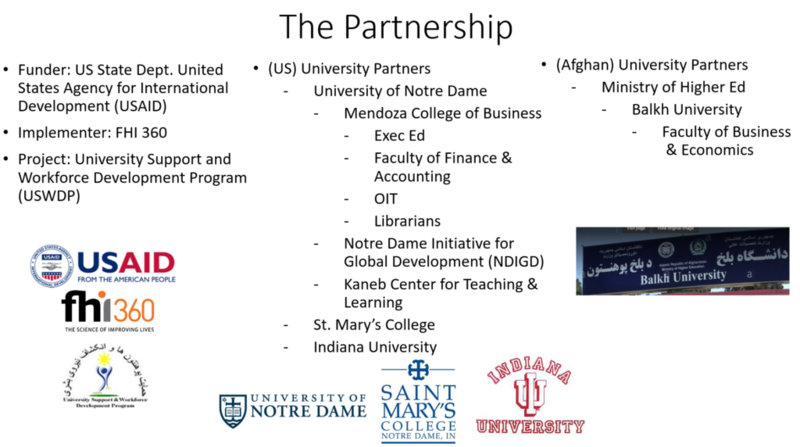 Many of Notre Dame’s peer organizations are part of Apereo. Those include Duke, Yale, Stanford, Brown, Princeton, and others. Each year, the Foundation selects nominations for the ATLAS award (Apereo Teaching and Learning Award) from the open source community that demonstrate innovative teaching and learning using an open source learning tool. Those awards include recognition at the annual Apereo international conference and funding for those team members to attend the conference and present on the winning nomination. 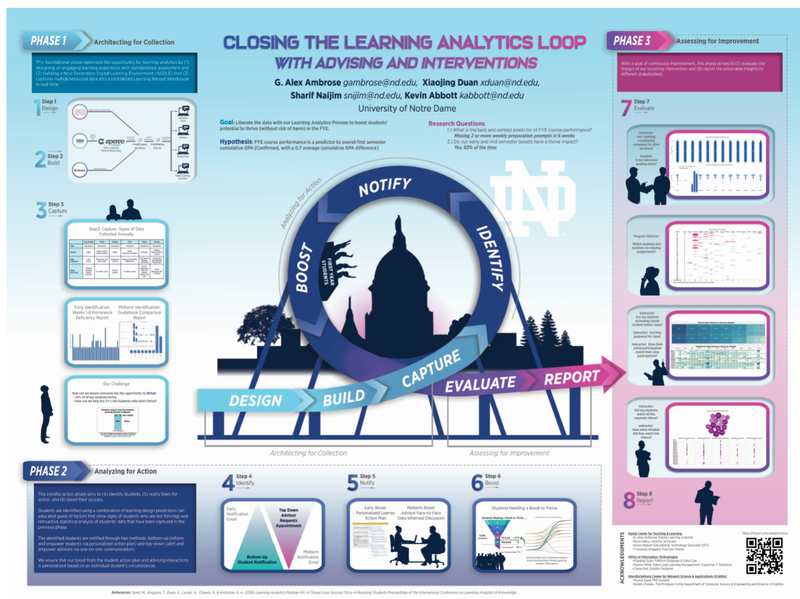 Our proposal was on the Moreau First Year Experience which is a required, two-semester sequence that helps first-year students make a meaningful transition to collegiate life at Notre Dame by integrating their academic, co-curricular, and residential experiences. Apereo tools form the digital framework of our courses. Our open-source learning management system, Sakai, contains all resource materials for both students and instructors as well as weekly reading/viewings and short reflections; a real-time gradebook; and a seamless interface with midterm and final ePortfolios assignments. Apereo tools ensure an innovative and transparent learning environment for our students, instructors and course administrators. We also worked with Digication, our ePortfolio provider, to create an LTI that would connect Digication to Sakai. That work was funded by Digication and we assisted with testing. The LTI was released by Digication for use by the Apereo community. -Click here for the announcement and to learn more about the award. Abbot, Kevin, Dawson, Maureen, Ambrose, G. Alex (2018) “How to Use Sakai and the Open Learning Record Warehouse with Learning Analytics to Empower First-Year Students to Thrive” Apereo Teaching & Learning Awards (ATLAS), Open Apereo Conference, Montreal, Canada. At Notre Dame, our goal is for all our freshmen students to thrive. According to U.S. News & World Report, Notre Dame ranks in the top 10 of national universities for freshman retention with a 98% retention rate. You might be wondering why we would be concerned with our students thriving since 98% of our freshman class succeeds. Our challenge is to engage those struggling 2% early enough to take action. Our First Year Experience course was designed to help our students reach their highest potential. 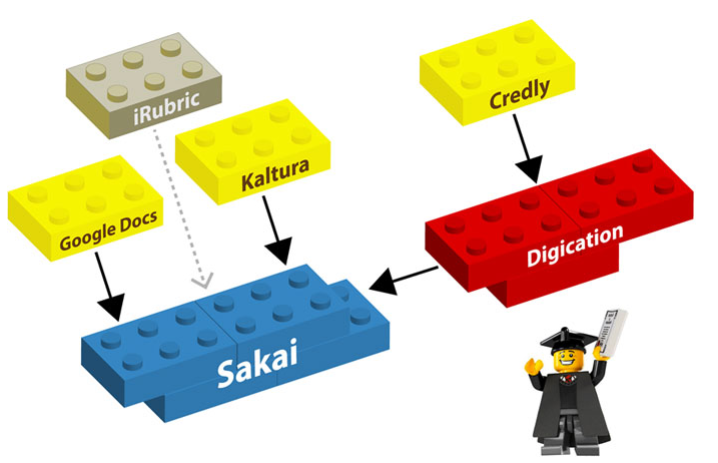 We maximized Sakai for the overarching structure of the course and Open Learning Record Warehouse for gathering data. 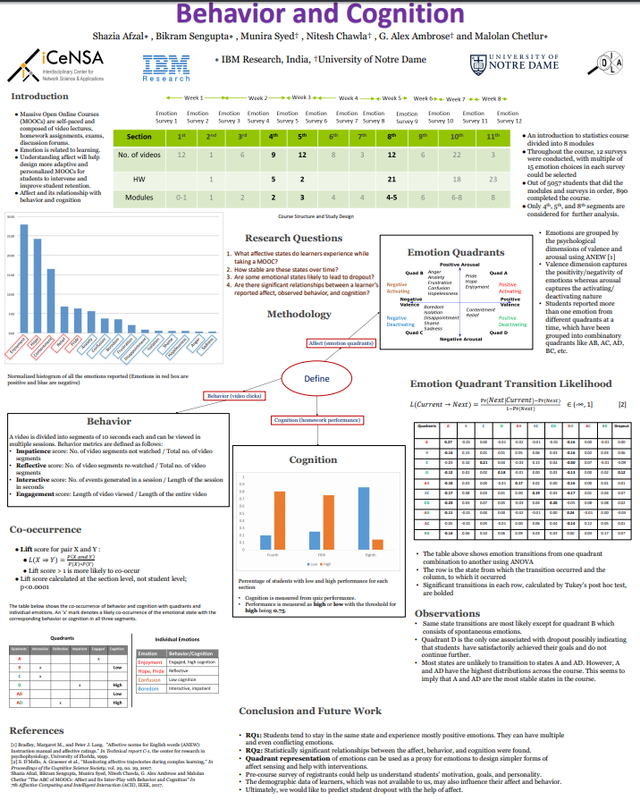 These ensured that all resources were available to students, at no cost, throughout the semester; that student work would be evaluated promptly and fairly; that course design and student progress were transparent; and that data was gathered for learning analytics and research. This session will walk you through how we designed and implemented the course, connected the data to the Learning Record Warehouse, how we used predictive analytics to move 83% of students identified as underperforming to thriving, and what is the best and earliest predictor of student success. Shazia Afzal, Bikram Sengupta, Munira Syed, Nitesh Chawla, G. Alex Ambrose, and Malolan Chetlur. “The ABC of MOOCs: Affect and its inter-play with behavior and cognition.” In 2017 Seventh International Conference on Affective Computing and Intelligent Interaction (ACII), pp. 279-284. IEEE, 2017.
also have important implications for the design of the next generation MOOCs that can potentially leverage affect and behavior-aware interventions to drive greater personalization and eventually, improved learning outcomes. The ability to authentically capture and assess student opinions and growth has always been a challenge. Polls, surveys, and focus groups are some of the most common ways for administrators to gather assessment data at an institutional level; however, these indirect sources only serve as proxy indicators of student voices and experiences. And while ePortfolios may provide better and more authentic direct assessment, they are usually not faster or easier. How can we merge the efficiency of the forms, polls, and surveys with the power of ePortfolios to have a faster, better, and a deeper look into our students’ expectations? We will provide an overview of our current text mining assessment methods for over 2000 students ePortfolio reflections given specific prompts. 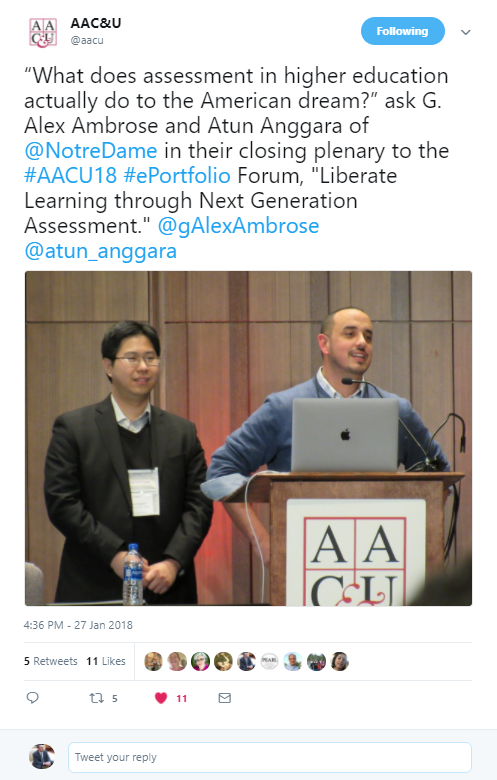 These methods will provide a counter-narrative to indirect surveys that liberate all of our students’ unique voices and allow us to better align their aspirations in the arena of higher education. And answer the questions…What does assessment in higher education actually do to the American dream? How can we move beyond efficient assessment to more effective assessment thereby liberating the learning and the learners? For the Mendoza Business Magazine (Spring 2018) faculty spotlight article see: “Equal Parts Hope and Learning” by Joe Holt associate professional specialist in Management & Organization. As a result of my involvement in this project in Afghanistan over the last 2 years, I have had the opportunity to come full-circle more than 10 years later from combat operations in Baghdad as an Infantry Platoon Leader. Soldiers are committed to serving a higher mission. 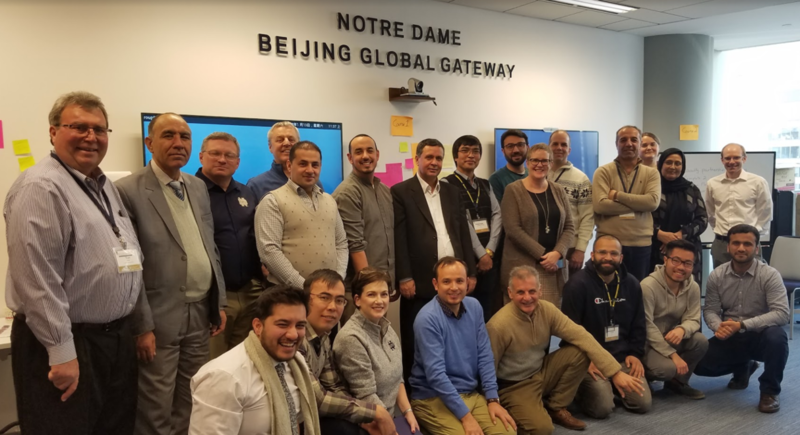 What has been gratifying to me as a veteran working at Notre Dame is to be able to continue that duty to the mission of liberating the people of Afghanistan.This international development project has given me the opportunity “to heal, unify, and enlighten” (from ND’s mission) through education. Empowering a University in Afghanistan to not only help develop the nation’s first master’s degree but do so in the area of Accounting to fight corruption with modern teaching methods allows “learning to become service to justice.” It has been amazing to see our University mobilize across the corners of campus in support of this mission —faculty from Mendoza Business College, administrators from Executive Ed, program officers from the Initiative for Global Development, faculty developers from the Kaneb Center for Teaching and Learning, language experts from the Center for the Study of Languages and Cultures, IT infrastructure experts, legal counsel, and librarians. 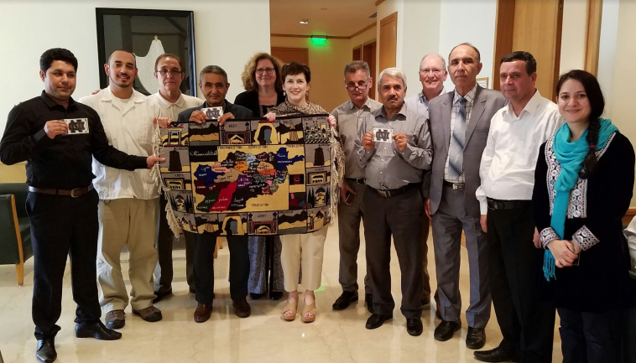 I am proud that 17 years after the war started in Afghanistan, the University Notre Dame is still committed to working in solidarity with the people of Afghanistan for the greater common good. I have seen first hand that the military may seek to destroy terrorists but education is the best chance at destroying terrorism. –Alex Ambrose, Professor of the Practice, Kaneb Center for Teaching Learning & Retired Captain US Army Infantry. Ambrose, G. Alex, Abbott, Kevin, Lanski, Alison (2017) “Under the Hood of a Next Generation Digital Learning Environment in Progress” Educause Review. 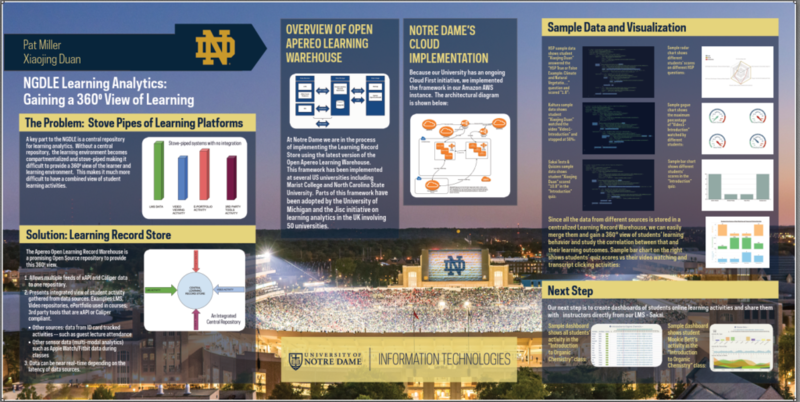 *A first-year experience course at the University of Notre Dame offered the opportunity to develop and test a next generation digital learning environment. *As a guiding framework for the digital architecture of the new FYE course, the design team followed the five dimensions of an NGDLE described in an ELI report to close the gaps between current learning management tools and digital learning environments. *The FYE course required innovating beyond the supplemental course-level learning management system to create a more holistic NGDLE in order to fully support the teaching, learning, and student success missions of the program. *Because they used an open-source LMS, they had a flexible hub with a campus support staff that could quickly, inexpensively, and safely begin to innovate at scale without high vendor cost or long development times.